Growing up in the Bay area, Lee and his family vacationed annually to the Tahoe Ski resorts. Always knowing that he wanted to make Tahoe his home, he eventually made his way here in 1982. Studying at The Culinary Institute Of America at Greystone, in Napa California, solidified his passion to create inspirational meals. After managing several restaurants in the Bay Area, along with a short stint at both Squaw Valley Ski Resort and Jake’s on the Lake, Lee finally found his home at Sunnyside Resort with the title of Executive Chef and partner. It had always been a dream of his to one day own a catering business. 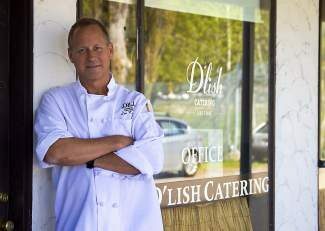 After spending 25 years with Sunnyside Resort, the opportunity came to purchase an already successful company, D’lish Catering, their dream came true! Lee has been presented with several awards including Tahoe’s “Autumn Food and Wine Festival” Best food and wine marriage, Best food, and Peoples Choice. Lee also sits on several boards for non-profit organizations such as Project Mana, the local Food Bank, Chocolate Wine and Roses (Tahoe Safe Alliance), along with numerous other community fundraisers. Currently residing on the west shore with his wife Leah, Lee is blessed to have two talented children, David and Cassandra, who have chosen to follow in their father’s footsteps! Producing high quality food with sustainable product is his promise. D’lish Catering is a team of professional chefs, event planners, bartenders and servers that enjoy living and working in Lake Tahoe. Since 1998 we have been passionately pursuing the best food and service for our clients. We care about our community and regularly compost, recycle and use local vendors.